As I have some home-grown madder waiting to be processed, I thought I’d write a few more words about dyeing with madder. After the madder roots have been dug up (and remember to dig as deeply as possible so as not to miss the thickest roots), they need to be washed well to get rid of the soil. Although some sources suggest otherwise, the roots can successfully be used freshly-dug and straight from the ground and I have obtained excellent bright reds from fresh roots. They can also be dried for use later. 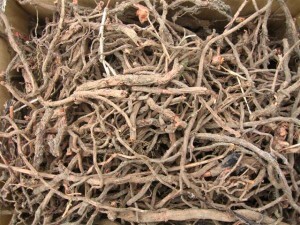 I usually soak the roots in a tub of water for an hour or two and then scrub them with a brush to get rid of the dirt. As it’s a good idea to wash out some of the less desirable brown and yellow pigments, it doesn’t matter if some colour leaches out into the washing water. Once the roots are clean, I chop them up as small as possible. (Incidentally, a garden shredder or an old food-processor can be very useful for chopping up madder & other roots.) If I don’t intend to use them immediately, I then spread the roots out to dry on sheets of newspaper on wire mesh or wooden trays or in shallow cardboard boxes. If I’m lucky and the sun is shining, they dry fairly quickly outside. Otherwise I put them in the airing cupboard. If you have to put the roots on top of one another, it’s a good idea to put a sheet of newspaper between the layers and make sure to turn them over regularly, so they don’t develop mould. Once they are completely dried out, I put them in strong paper sacks and store them in a dry place, either under a bed or in the airing cupboard. It’s important to keep them away from damp and wet, as they can easily become mouldy. It’s not too disastrous if they do develop mould as they still seem to produce a reasonable dyebath, although the colour may be duller. To obtain a true red from madder it is necessary to use an alum mordant. However, madder can also be successfully applied to unmordanted fibres, especially wool. The colours obtained without a mordant tend to be more orange or brown in tone but using an alkaline modifier (for example washing soda) can often produce some very attractive shades of pink. 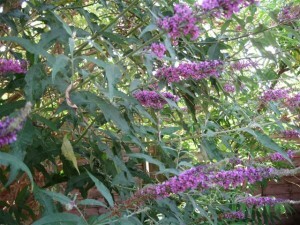 An aubergine purple can also be obtained from madder by using iron as a mordant and then applying an alkaline modifer. I’ve done many experiments with madder over the years, usually leaving the roots in the dyebath & either dyeing without heat at all or following the often-repeated instructions to keep the temperature low for reds. However, I discovered a little while ago that madder root can be simmered to extract the colour, just as one does with other dyes, without losing the red. Before I do anything else, I wash the roots in cool to warm water, then strain them through a sieve to get rid of the water. I then put the same roots in a pot & pour boiling water over them (at least enough to cover them well), leave them for a minute or two & then strain off the liquid, which can either be thrown away or used for a separate dyebath. This gets rid of some of the less desirable yellow & brown pigments. If I’m feeling really brave, I may repeat this last process once more, especially if I plan to save the discarded liquid for a separate dyebath, but I’m always afraid I may be removing some of the very desirable red dye, as well as the pigments I don’t want. Then I add more boiling water (or cool if you prefer not to keep boiling up the kettle) to the same madder roots & simmer them for about 30 minutes. I then strain off the dye liquid, let it cool to well below a simmer, add the fibres & leave them to steep for as long as it takes to get the red I want. I may add some heat after a while but I never allow the dyebath to simmer once the fibres have been added. This method seems to result in reds just as good as, and often better than, those from the more common madder-dyeing methods. And the roots can be simmered again for another dyebath. If you live in a soft water area, your tap water may be too acidic to be able to achieve reds from madder and you will only get oranges and rusts. These shades can be shifted towards red by using an alkaline modifier, such as a washing soda after-bath. 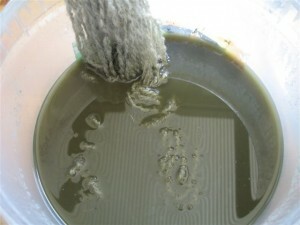 Washing soda can also be added to the prepared dyebath but only if you plan to apply the dye without heat. It’s important to remember not to apply heat to any solution containing washing soda, especially if you are dyeing wool, as this may destroy the fibres. Madder is a truly remarkable dye & it is often difficult to completely exhaust the roots. I now often dry out the roots after the first dyeing process & store them ready to use again later. If you do this, don’t store the dried roots in plastic bags as they readily become mouldy if they get the least bit damp. (Actually, they still seem to be fine to use even if they are mouldy, although the dyebath smells less pleasant.) I dry the roots out in the airing cupboard as described above, then put them in paper sacks & store them in the airing cupboard or under a bed until I need them. If you grow your own madder, don’t forget that the dried plant tops also give pretty colours. Around late Autumn, the plant tops start to look dry & pale, like straw, & they can be cut off & used for a dyebath. 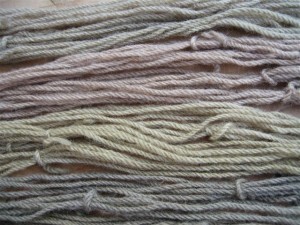 With an alum mordant, they can give pretty pinks & without a mordant they give beige to tan colours. Those of us who have buddleia bushes in the garden tend to accumulate a great deal of pruned material, when the bushes need to be cut back. I have used these prunings in the dyebath several times and achieved some pleasing results. This year I have already cut back one of my buddleia bushes and this time I decided to separate the dead flower heads from the leaves and stems to see which parts gave the most colour. This photo shows: On the left the results from the “dead flower heads only” dyebath and on the right the results from the “leaves and stems only” dyebath. In each set the top skein is unmordanted, the second skein is alum-mordanted and the third skein (also alum-mordanted) has been modified in iron. I poured boiling water over the materials for each dyebath and left them to steep overnight. In the morning I simmered the dyebaths gently for about 45 minutes, then added the skeins. I left the plant materials in the dyepot for the unscientific reason that I was too lazy to look for my sieves to strain off the dye liquid. Yes, I know I should be ashamed of myself! In general, I usually strain off the dye liquid to avoid having unwanted plant pieces lurking among the dyed skeins. However, it doesn’t really matter whether the plant pieces remain in the dye pot or not, as long as the dye colour has been properly extracted. 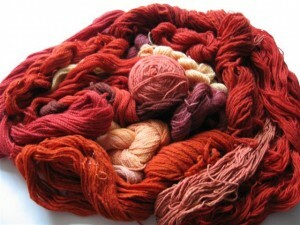 The notable exception to this generality is madder root, which most dyers prefer to leave in the dyepot, as it gives up its colour gradually at temperatures below a simmer. 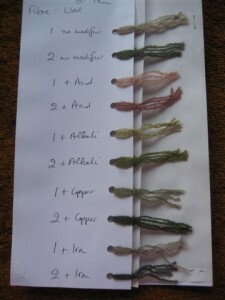 (More about madder dyeing to follow in a later post.) There will no doubt be other dyes that some dyers prefer to leave in the dyepot and the choice is really a personal one. Once the skeins had been added, I simmered gently for about 30 minutes then left the skeins to steep until the dyebath had cooled. I was interested to note that the unmordanted skeins took up almost as much colour as the alum-mordanted ones, although only light- and wash-fastness tests will show whether the dye is as fast on the unmordanted skeins. The amount of colour available from the dead flower heads was surprising. In future I will probably continue to separate the plant parts and make two dyebaths, as this extends the colour range available. Dyers who grow woad will often find they have far more woad seeds than they could possibly need for sowing themselves or passing on to other dyers. 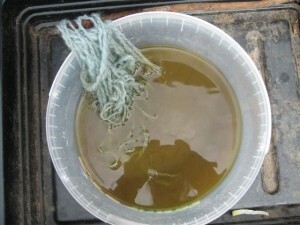 Some years ago I did some tests using ripe purple/black woad seeds in the dyepot and I was intrigued by the results. This rather dark image shows the page from my record book where I have the samples from this dyebath. The upper (1) of each pair of samples is unmordanted and the lower (2) is alum-mordanted. 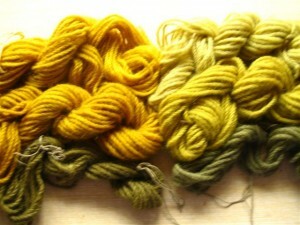 The seeds produced an attractive green on alum-mordanted wool, and a more yellow colour on unmordanted wool. Perhaps the most interesting sample was the one modified in clear vinegar (acidic), which produced a pale pink on unmordanted wool and a deeper pink colour on alum-mordanted wool. An alkaline modifier gave lighter yellowy greens, copper intensified the greens and iron produced greyish greens. Woad seeds can be used in the same way as most other plant materials and I would suggest using at least the same weight of seeds as fibres (100%). Simmer the seeds for about 45 minutes to extract the colour, then strain off the dye liquid, add the fibres and simmer them for about 45 minutes to an hour, or until the colour is deep enough. 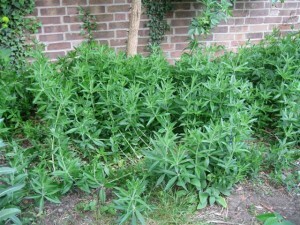 Recently I collected a bagful of woad seeds for a dyebath. This time about half of the seeds I used in the dyepot were not fully ripe and were still green in colour, rather than purple/black. The colours I obtained this time were less interesting, suggesting that it is advisable to allow the seeds to mature fully and become black before using them in the dyepot. From top to bottom the samples are: No modifier, + acidic modifier, + alkaline modifier, + iron modifier. For each category there are two samples: the upper one is unmordanted and the lower one is alum-mordanted. The shades are very similar to those achieved from the earlier dyebath using fully mature seeds, but considerably less intense. I mentioned in the previous post that I’d tried a fermentation vat from Helen Melvin’s booklet on indigo and the above photos show the initial stages of the vat. (I think the difference in colour between the vats in the photos is because one photo was taken indoors and the other photo outside.) The recipe is for indigo powder but I used woad powder instead. I have to confess that indigo and woad fermentation vats present a challenge to me, as I’m not a naturally patient person and I tend to become over-impatient with vats that can take several days to come into order and require frequent tending. This particular vat uses yeast and molasses to induce fermentation and remove the oxygen from the vat, and washing soda as the source of alkali. The pH level needs to be checked regularly, as the fermentation tends to make the vat increasingly acidic. When this happens, more washing soda has to be added. The vat also has to be kept warm over several days and this can require ingenuity as, even in the hottest UK weather, the temperature can drop considerably at night. As keeping the vat on a hotplate seems an unnecessary use of electricity and the weather was fairly hot anyway, this time I placed the vat (in a lidded plastic container) inside the tray of a plant propagator, before putting on the lid. At night, I brought the vat into the conservatory and kept it overnight in a container of hot water. (On reflection, it might have been better to have left the vat in the propagator and packed it round with polystyrene or straw to keep it warm, as the water became cool during the night.) 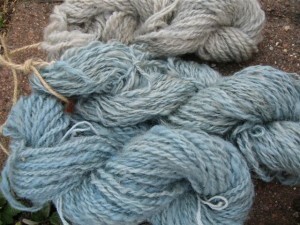 After about two days the vat was usable and I managed to dye a skein of wool a reasonable shade of blue. (As I wasn’t sure how well the recipe would work and I didn’t want to waste my precious woad powder, I suspect I was rather mean with it and that meant the colour produced was not very deep.) I kept the vat active for another couple of days but by this time my patience was running low and the odour of the vat was beginning to be rather unpleasant, even to my less than delicate nostrils. So I decided it was time to pour the vat away. So why bother with fermentation vats? This is a question I ask myself each time I make a fermentation vat. I think the answer is that it does me good to be presented with a challenge and to have the chance to appreciate how skilled the dyers of the past must have been. I have convenient pH papers, with which to check the pH value of the vat, but the dyers of the past had to rely on experience, appearance and taste. They knew exactly how and when to “feed” the vat to keep it active over a long period of time and when to allow it to rest. I think I regularly try out fermentation vats so that I can feel entitled to call myself a dyer.